For Wynton Marsalis (Trumpet Solo with Band). Composed by Jean-Baptiste Arban. Arranged by Donald Hunsberger. Concert Band; Masterworks; Performance Music Ensemble; Single Titles. Donald Hunsberger Wind Library. Form: Fantasia. Masterwork Arrangement. Score. 60 pages. Alfred Music #00-35427S. Published by Alfred Music (AP.35427S). 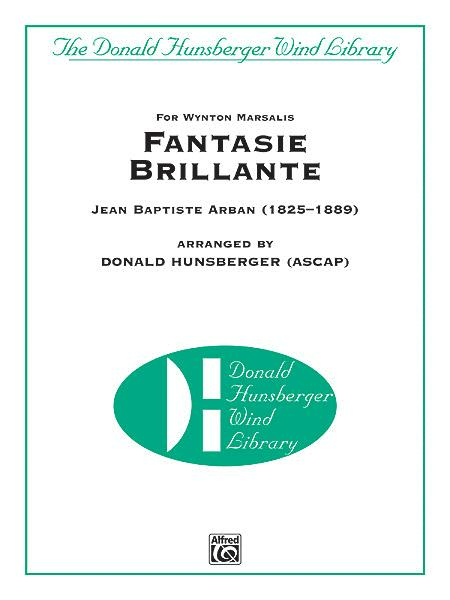 Scored for trumpet soloist Wynton Marsalis, Donald Hunsberger's band accompaniment arrangement of Fantasie Brillante No. 3 in Jean-Baptiste Arban's collection of Fantasias and Variations possesses a breadth of musical styles that demand strict formal analysis in addition to interpretative and technical requirements. The opening section features a flowing melodic passage followed by a technical passage with a return to the style of the opening melody. The theme is then stated which leads into three variations that employ variants in triplet groupings, quadruple 16th-note groupings, and finally, the ever-present triple tonguing, once again a primary technical resource utilized in this and others of the Fantasias. Fantasie Brillante is one of eleven solos in the Marsalis/Hunsberger Carnaval project. The recital version of all eleven trumpet solos with piano accompaniment is available in one book for soloist use in preparation or for recital performance (00-35429). Hunsberger's band accompaniments for all eleven solos are available from Alfred either for sale or as rental works.Recordings of all eleven tunes performed by Wynton Marsalis with band accompaniment (performed by the Eastman Wind Ensemble, conducted by Donald Hunsberger) remain available from Sony BMG Music Entertainment, on iTunes and a variety of other retail sources. A truly remarkable sparkling collection to feature your trumpet soloist.